A 14 x 16 Platinum Series VocalBooth: black exterior, black in-swing door with 2'x2.5' window, pyramid charcoal Auralex foam, and high capacity output ventilation system. After relocating to LA from the UK, Gary wanted to turn his guest house into a professional studio. 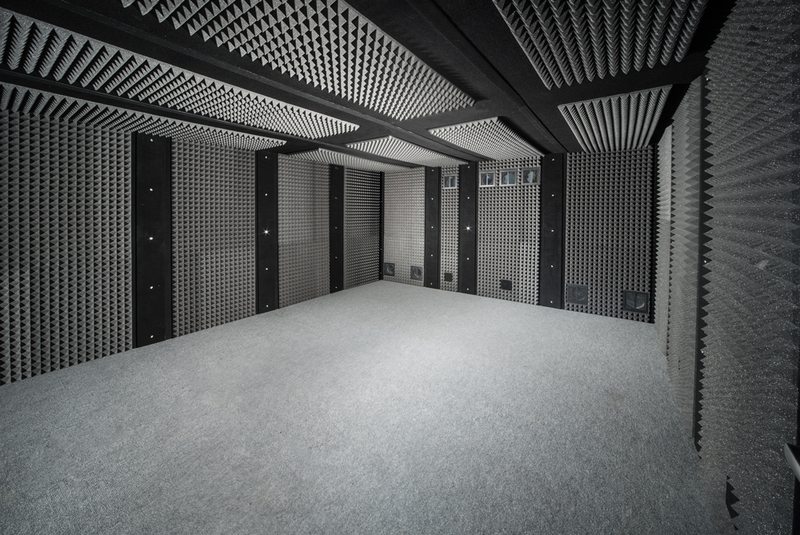 He learned that a VocalBooth would be nearly one-third the price of his contractor's bids to permanently alter the space, did not require any permits, and could be assembled in just one day! Gary opted for our "premium delivery service," where a VocalBooth representative arrives onsite to coordinate delivery and assembly. I'm extremely happy with my VocalBooth. From the initial contact to finished installation I found VB an extremely professional company to deal with. Good advice during the build, good price and prompt answers to every question I asked. In just a few weeks it was manufactured and delivered, on schedule, and it was installed in just one day. The build quality is of a high standard. The sound inside is fantastic, very impressive, and the amount of noise escaping from the room is virtually nil. Also, as I live close to an airport, keeping aircraft noise out was essential, something the Booth also does admirably. Jets fly over regularly but I have yet to hear one when I'm in the room. Buying the booth was one of the best decisions I've made in a long time. It's a great place to work. Gary Numan.